Monterra is located at the base of the McDowell Mountains at WestWorld in North Scottsdale. Our Ballroom and patios offer breathtaking views of the WestWorld polo fields, mountains and high Sonoran desert. Our spacious patio, beautifully appointed with a fountain, wood burning fireplace and a bar is an ideal location for a ceremony or cocktails and butler passed hors d’oeuvres prior to dinner. 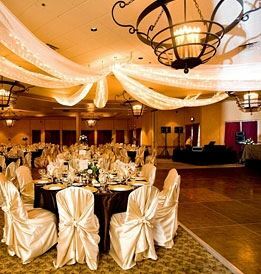 At Monterra, we can provide a stage for your musical entertainment, tables, linens, and a dance floor along with our exceptional food and personable service.